The new crossover is to be available for purchase on in spring 2016 and will be based on the same platform as Jaguar's new XE compact sedan, which includes an aluminum-intensive modular architecture, reports Auto News. 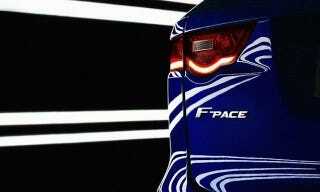 Apparently, the F-Pace has been put into testing and has been approved for production because of the "overwhelmingly positive response to the C-X17 concept" said Ian Callum, director of design for Jaguar, said in a released media statement, according to multiple reports. The Jaguar F-Pace, inspired by the F-Type, represents a perfectly judged balance of style, performance and practicality. The question, of course, is whether or not the F-Pace can actually help increase sales in the United States, where demand has been sagging considerably. Despite the growth of the luxury market, Jaguar's U.S. sales have actually dropped 7 percent. All of Jaguar's market competitors have a luxury crossover model available, so Jaguar is apparently hoping to muscle in on the segment. We still haven't any idea when we'll actually see the F-Pace in the flesh, er, metal? But as soon as we do, you'll see it too.